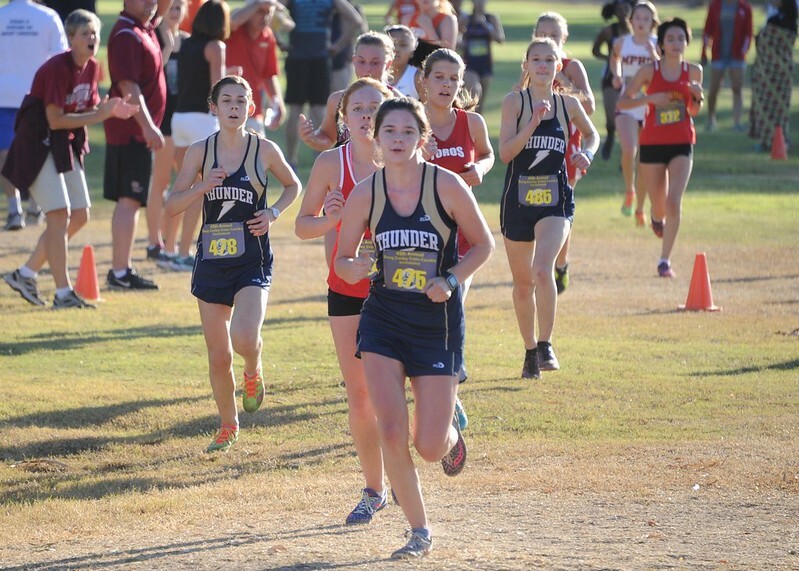 The DVCC Girls competed in the 45th Annual Doug Conley Invitational in Tempe, AZ on Saturday, September 23. There was a bit of reprieve from heat and the morning started off with fall-like temps. The girls put forth excellent effort and it showed in their results! For the past several years, this has been a 3.0 mile course but this year it was 3.1 miles. Many girls finished with personal records! The Non-Varsity race kicked off the meet and Desert Vista placed 7th out of 30 teams and 347 runners! Sophomore Jessica Condon (21:55) was the first to score for the team, followed by Freshman Hannah Garcia (21:58), Senior Emma Janas (22:04), Senior Emma McCutchen (22:40) and Junior Dani Prasad (22:47). In the Invitational race, the girls took home the first place trophy competing against 27 teams and 176 runners! The scoring team was led by freshman Quinn Boardman finishing in 5th place (19:34), sophomore Maddy Shoemaker in 20th place (20:04), sophomore Kyra Mazanec in 24th place (20:25), freshman Eve Boardman in 36th place (20:41) and sophomore Julia Nelson in 38th place (20:44). Finishing just behind these girls were Senior Keilani Fang (20:45) and junior Sydni Nedza (21:14).